Toyota unveiled an 850-horsepower Camry sedan at a Las Vegas trade show Tuesday. Yes, it's insane. No, you can't buy one. Compare that horsepower figure to a Lamborghini Huracán, which packs 602, or a Dodge Challenger Hellcat with 707. Toyota (TM) calls it the "Sleeper Camry." Generally speaking, a "sleeper car" is one that looks like a regular, everyday car from the outside but that hides a surprisingly powerful engine under the hood. This car takes that idea to the extreme. From the outside, only the wheels and tires offer any clue that it's anything but a new Toyota Camry. 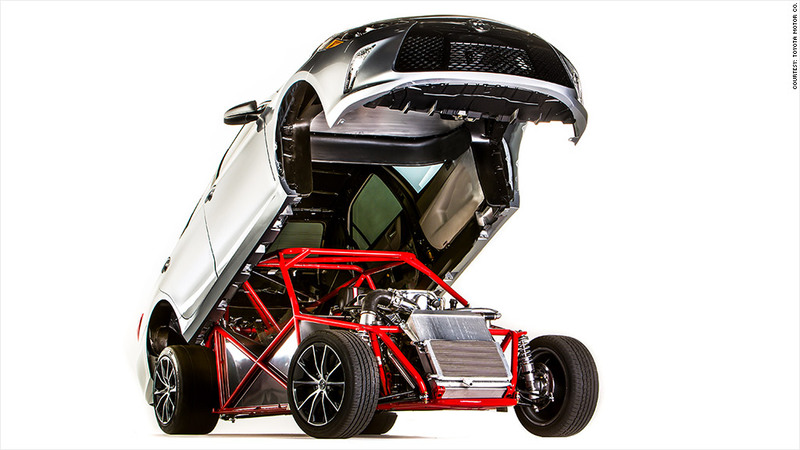 "This Camry is the ultimate sleeper — it definitely has the element of surprise on its side and more than enough muscle to drop the hammer on any unsuspecting car that pulls up," said Chuck Wade, of Toyota's Motorsports Technical Center Director. On the inside, there's pretty much zero resemblance to any Camry you've ever seen. Ordinarily, a Toyota Camry is a front-wheel-drive car powered by a four- or six-cylinder engine. Maximum horsepower: 268. This rear-wheel-drive car's 5.7-liter V8 engine and transmission were taken from Toyota's full-size pick up truck the Tundra. A supercharger was added to the V8, in addition to a system that feeds in nitrous oxide for even more power. This car is clearly intended for the track, not the street, though. There's only one seat for the driver. It was unveiled at the Specialty Equipment Market Association (SEMA) show, which features add-on parts used to customize cars. Major automakers often unveil highly modified show cars at the event.